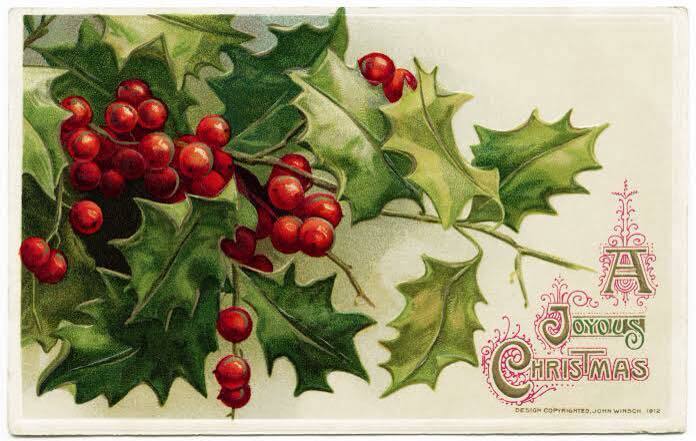 I really hoped I'd get a post in before this year is over, I can't believe how fast 2018 has flown by. Each year I make a commitment to try and document the creative elements of my life more often, but time seems to run away from me and I find myself thinking about it rather than doing it. I'm starting to wonder if it might be time to post more to Instagram as it's much faster ... I'll have to think on it, as I really don't want to give up on blogging entirely. This is something I drew up based on some things I've seen on Pinterest - what a fabulous resource that is. The circle base is cut out the size of our everyday dinner plates, and the hexagon shape has 4" sides. The hexagon is the base of the 'gazebo' and though it's an unlikely prospect in real life, the inside of my gazebo has royal icing snow on the floor. 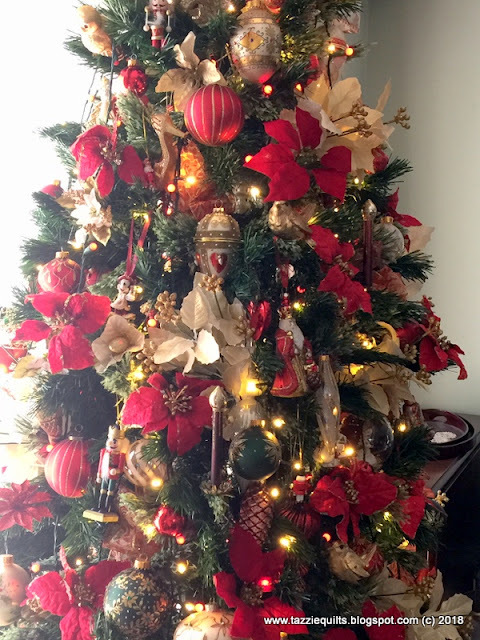 The tree is simply an icecream cone decorated with green royal icing piped thru a star tip. I always use brown royal icing for construction - it hides all kinds of sins, and IMHO it gives a much neater finish. When it's dry I can come back and make things pretty with white royal icing. I've used gelatine sheets for glass in the windows, the criss cross pattern almost looks like leadlight. The walls were 4" wide by (I think) 5.5" tall, and I thought it would be nice to make the windows a little interesting. I don't mind confessing I was concerned that the roof would fall in before it dried - I had a slightly taller pointier roof in my mind, but that's not what I managed to bake. During construction I also put a string of Ikea battery operated LED's inside so it would light up. Fun! And now that all the Christmas festivities have concluded for the year, I've had time to work on a little of the hand quilting on Phebe. I'm enjoying it again, and have been looking forward to each time I get to move the hoop and work on the next section. Though now I'm on holidays, it's all I can do not to work on a new project. 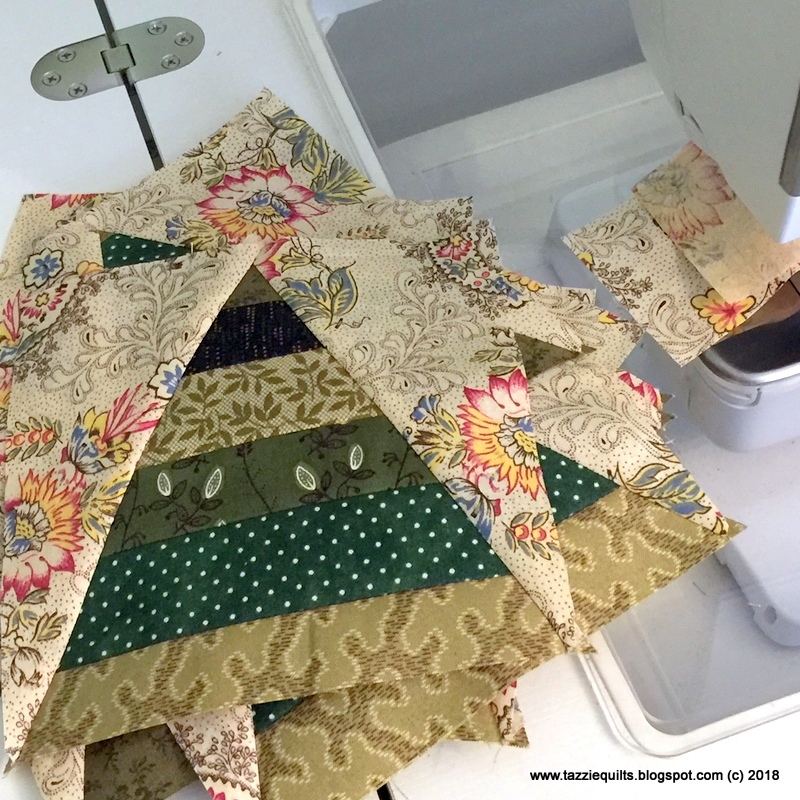 One of the sweet ladies that comes to class is working on the Rajah quilt by Lessa Siegle - I just love it and really want to make it too. I can't promise that I won't get started on it ... and you know I'll share if I do, but I have to show restraint. I have so many other things that I need to be working on! Well hello friends :-) I thought I'd pop in and share a couple of happy snaps with you. 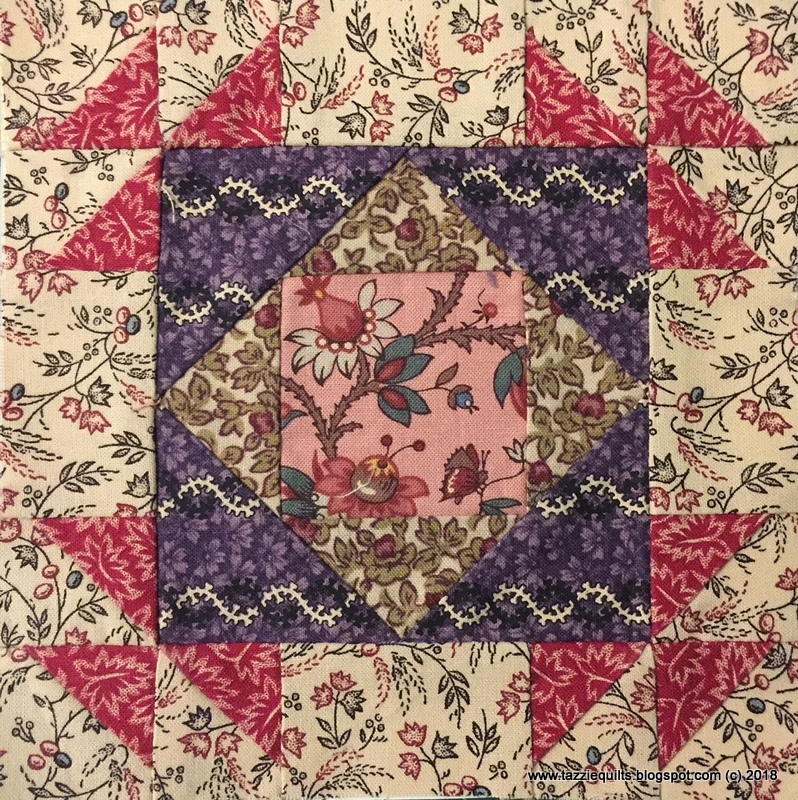 Some of the sweet ladies that come to Thursday class had asked to learn English Paper Piecing (as well as some other things), so I made up a little something-something that we could play with. This is the first block I made - I used bits and pieces left over from making Mrs Billings while I paper pieced the stars - I don't think the Mrs Billings scraps will ever disappear, they seem to be reproducing! This is as far as I went with my quilt top, though I made the pattern for the girls to have 5x5 blocks. 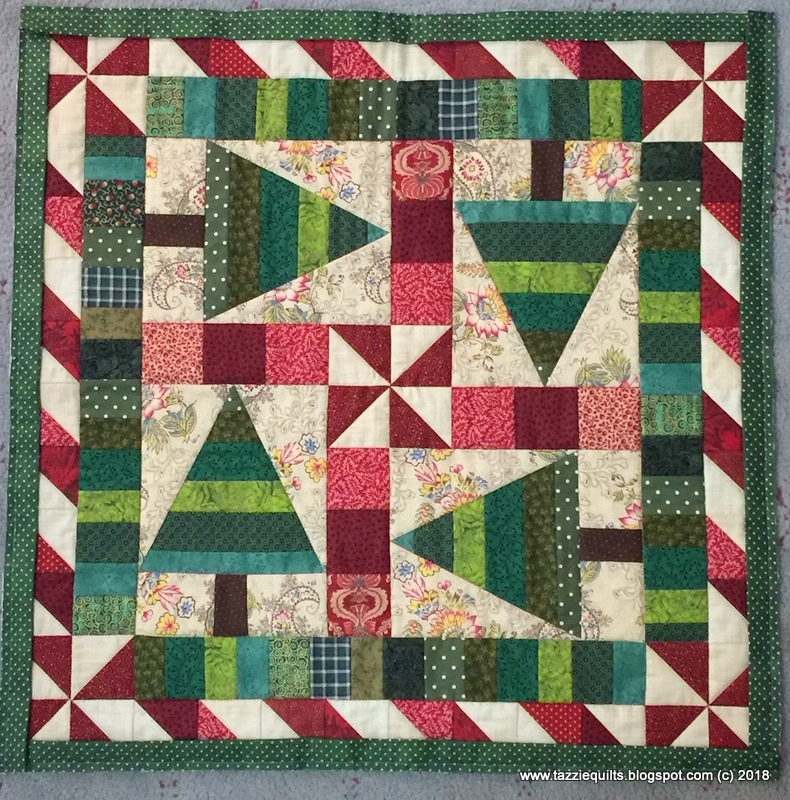 I also gave an option for some paper pieced sashing strips if they wanted to do them - for me though, I couldn't look past this wonderful FG border print. It's just divine. The border print actually had five repeats across the width, so I used the last strip to make up this little table topper using the Kaleido-Ruler. I've made so many of these over the years, I honestly think the number may be in the hundreds! I'll pop the binding on over the next week and it'll look cute on the coffee table or something. Last of all, I managed to move the hoop once while hand quilting on Phebe. Progress is slow, but enjoyable. 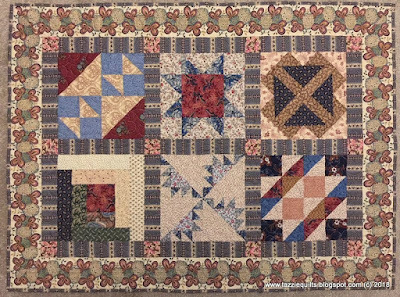 I've made the decision that I'm not going to rush along on this project - I'm not quilting to a deadline - it will be finished when it's finished - and that has lifted a little stress from my shoulders. Tonight I had settled in for a night of hand quilting, when it occurred to me that it wouldn't be a bad thing to quickly grab the laptop and do a little sharing. I've been a busy bee, and have tried to record a few of my activities in pictures. And in news other than quilting, on Friday last week I made these cupcakes for my lovely friend Kathy who was celebrating her 50th birthday. I do love making cupcakes, and never say no to a reason to bake them. Springtime is a beautiful time to spend wandering the gardens, and I'm always inspired to come home and tinker in our own garden. It's a shame I don't have much of a green thumb, I usually leave the yard work to the hubby. And last of all, I wanted to share something I've been working at for a little while. 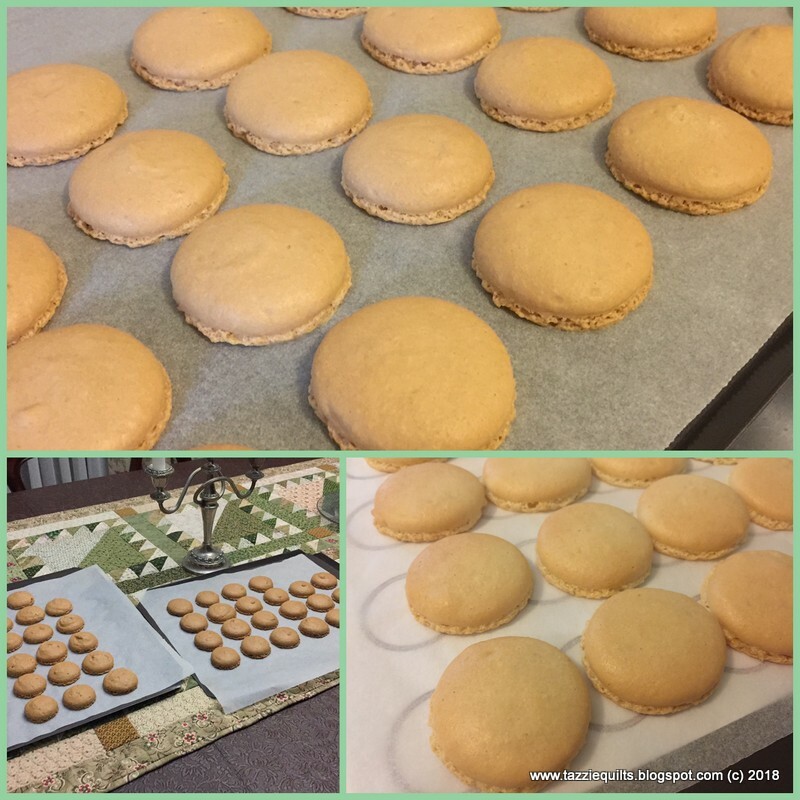 This year I made myself a promise that I was going to learn to bake French macarons. They can be quite tricky but I resolved that with practice I should be able to figure it out. Well, let me tell you, I made many many mistakes, and to coin a phrase of the wonderful recipe that I'll share with you ... I baked a lot of 'macawrongs'. However, I stumbled across this recipe at Not So Humble Pie, and it has rocked my macaron world! 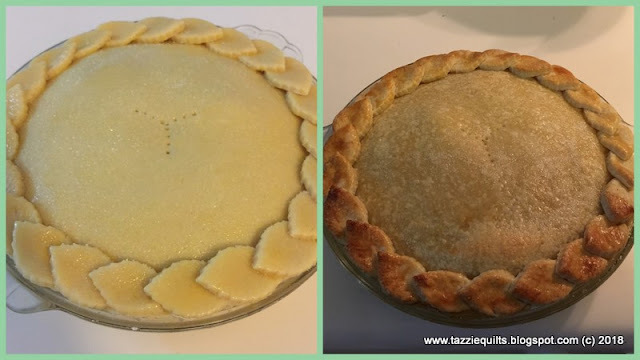 The small picture with two trays was an early one and I was still perfecting my piping - the flourish to finish off was hard to master, so those ones are a little lumpy. I used a little brown food colouring in those ones. The other two pictures are au naturel - no food colouring at all. Other times I've made them pink, and purple as well. Sometimes I didn't even bother to fill the macarons while I was still practicing, as Camo was more than happy to eat them just as they were. I'm so happy with my progress, and can't wait to bake some more. Though I've taken a little break from them over the past few weeks as it's not great for the waistline having these treats in the house! Do check out the link above though if you're interested in baking macarons, the recipe is just perfect and has all the wisdom in the world for helping you troubleshoot. Well hello! 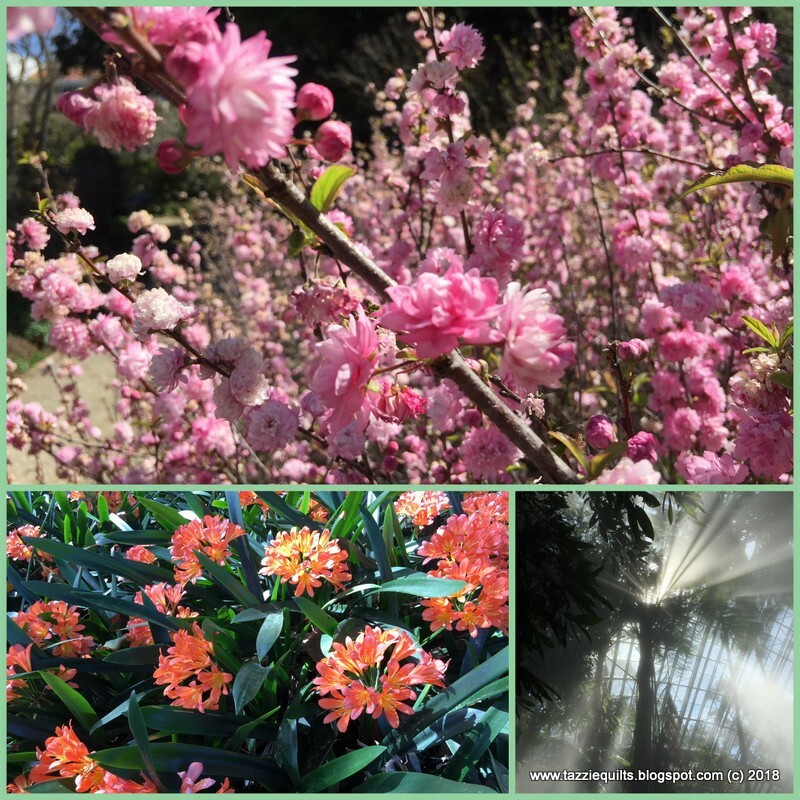 I certainly did not intend to be absent from my blog for a whole month, but it seems that is exactly what I have done! Definitely a whoops! I don't have a good excuse, only that I seem to quite busy, but who isn't? We all cram a bunch into our lives don't we? Just so I have a little eye candy for you, I'm sharing a picture of where I'm at hand quilting on Phebe. I haven't done a lot, but I'm happy with how it's coming along, it's still a fun project and I'll spend any spare moments working on it. Hi there lovelies, thank you all so much for your kind words on the finish of my Phebe quilt top. It was so nice to read all your sweet messages, it really made my heart sing. The top is visiting with Lizzy to get ready for hand quilting, and I'm looking forward to starting that when the time comes. 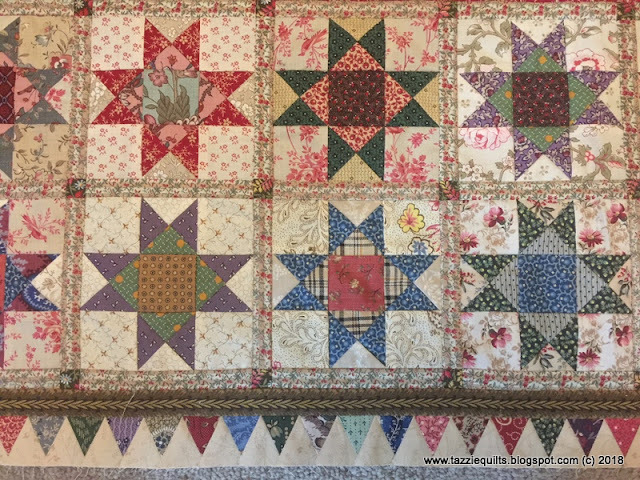 The slightly abandoned project was Honouring our Quilting Heritage by Lori Smith - though I loved working on the blocks, Phebe bullied it's way into being my priority ... it seems to happen a lot with me! This was a really fun block to put together, and I was able to use plenty of the scraps I had worked with while stitching Phebe. Some of these fabrics were dug out of my box of 'Donna fabrics' - my USA friends are all so kind to share their stashes with me! If my records are correct, I now have 36 blocks made and there are a total of 59. It doesn't seem like there are TOO many left to make, but if I know myself there are probably a lot of hard ones left in the mix! And in other stitching news, I've started working on an exchange that some of my lovely USA friends have organised. And Phebe is finally done! 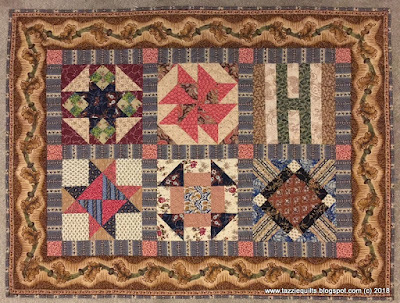 It's another big one, I can't lay it out fully anywhere in the house - so I'm sending it on to my lovely longarming friend Lizzy to baste for me, and then I can get busy with the hand quilting. There are so many different fabrics to look at, my eyes are skipping all over the place seeing new things. Can I share a secret with you? When I first started putting the final borders together I was really unsure about whether the fabric I used in the large triangles was the right one, I felt it might have been too dark. I love it now though, and I'm so glad I purchased it on a whim from Hetties Patch. Isn't the Nutcracker in the background a cutie? Manuela bought it on her recent trip to Germany - after seeing her pictures I don't know how she showed restraint - I definitely would need extra luggage - the German Christmas stores are amazing! I just dumped the quilt on the floor in the sewing room and haven't straightened it up properly so it looks a little jiggly wobbly, but you can see it's coming along. I think I will do a little unpicking though - the top of the star block in the very corner doesn't meet with its neighbour nicely enough for my liking so I'll sort that out tonight. As soon as the top is done I can hand it on to my lovely long arming friend Lizzy to baste for me, and hand quilting can begin in earnest. Isn't it pretty? I've never seen a '3 section relish dish' in the wild before so I had to bring it home with me. They did also have a dinner plate, but I left that behind because at $55.00 the price was too steep - and lets be honest, the 20 plates I already have are plenty! Well, that's it from me, hopefully the next time I check in with you all I should have this top completely finished - fingers crossed! I haven't laid it out on the floor very well, and the light coming through the window in the sewing room has washed it out a lot, but I simply couldn't wait to share it with you all! 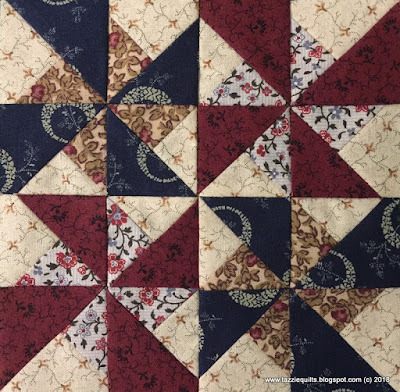 Basically, all that remains is the final border with pieced stars set on point. 56 stars are required, and I've made 13 of them so far - I need to get my skates on and get busy piecing! Chatter soon! Time keeps rolling, and so very fast! Heavens, it seems like I've barely had any time in the sewing room since I checked in with you, but I kind of have - just not in a newsworthy (or share-worthy) way. 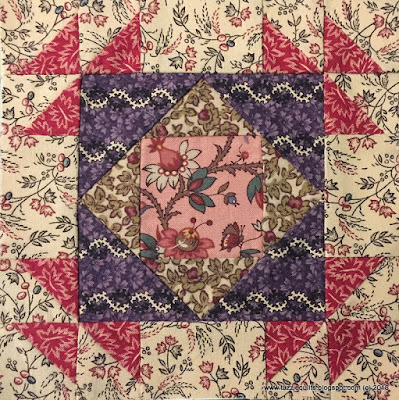 I don't quilt much for others anymore, but I agreed to finish up projects for two of my lovely ladies that come to classes - I also finished up two secret squirrel projects that I will share with you later on, and I've been teaching a sweet friend who recently retired to quilt. This has all meant that my Phebe project got put on the back-burner for a bit, but these past few days have spared me some time to pick it up again. It looks kind of wonky in the picture, but trust me when I tell you that it's all lovely and straight, but the edge is kind of flapping up in the air unevenly. It'll look super when the next round is attached - but that will be a while as it's a border of about a bazillion triangles with a 1" base! I see lots of foundation piecing in my future. Whoops! There's a problem with that green pointed star for sure! I can't believe this one slipped through the cracks - when I look at the back of it I realise I had unpicked it a few times too - a few of my early blocks had seam intersections that didn't thrill me, so I redid them, and I think this may have been one of them. Anyway, I've fixed it now - I hope I haven't let any more slide thru! Since I've learned that pastry is not nearly as difficult as first thought, I've also made two lemon tarts over the last couple of weeks, and I see more in my future. Let me tell you that Weight Watchering is very challenging when there are tasty baked goods hanging around. 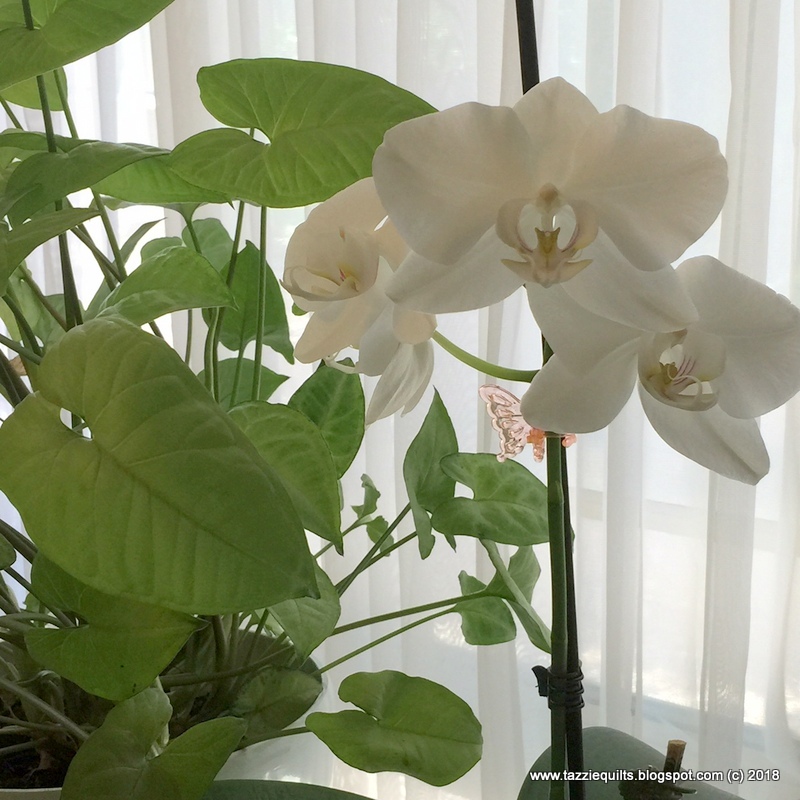 Before I sign off, I wanted to say Hi and thank you so much to Andy who commented recently. I wasn't able to reply to you directly as your email address didn't come to me, but I appreciated your kind words very much. And I feel the same about every comment I receive, it's lovely that you all stop by and share your thoughts. But now I'm heading back into the sewing room, and I'll check in with you all very soon! 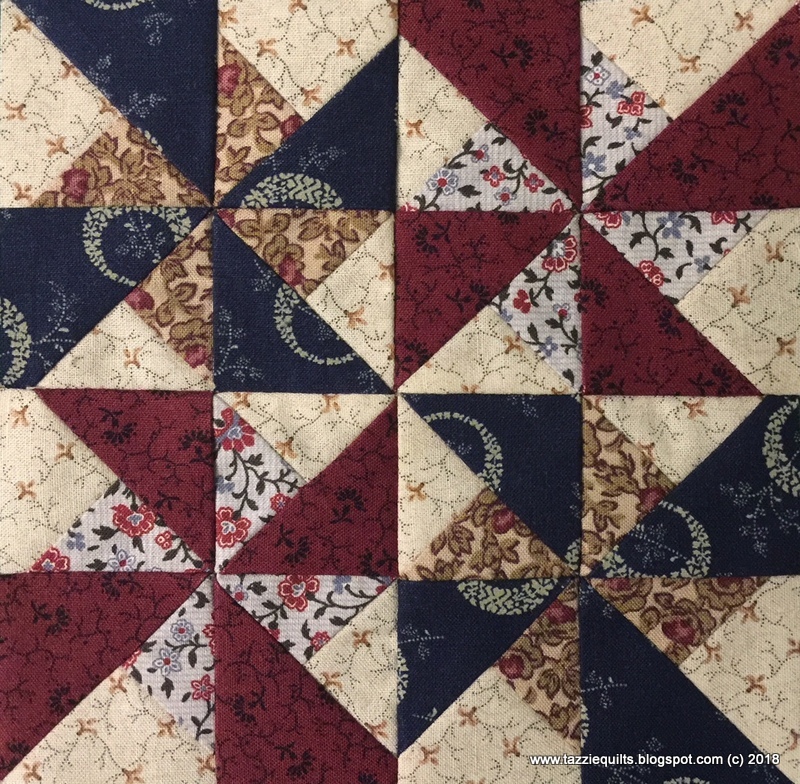 Early this week I got the last of the stars in place on this section of the Phebe quilt top. I'm thrilled with how it's looking at the moment. I don't mind confessing that after I put the first section in place I wasn't sure if it was all accurate - sometimes a heavily pieced border can make the next addition look a little full - but as each next side was added I realised it was all going to be just fine. I have more anxious moments ahead of me though, as the next rounds are all heavily pieced too. I haven't been able to start on these next borders just yet though. I just have a couple of other doodads I've wanted to work on for a while, and I'm almost finished - at the moment I can't share, but I promise I'll show you in due course. It makes me giggle without fail when lovely people commenting tease me about having time management superpowers - I promise this isn't the case - the past two weeks were school holidays, so I had more time than usual on my hands - there was no school drop off/pick up run, the endless sporting activities for Camo and I were at a halt ... and the stars were already made from September/October last year and sitting waiting for me to put them to use. So really, not nearly amazing at all! Just the rows at the top of the quilt to go now, and it's onto the next steps. Please don't think I've made all those stars since I checked in with you last, all the stars were already made and patiently waiting for me to pick them up again. 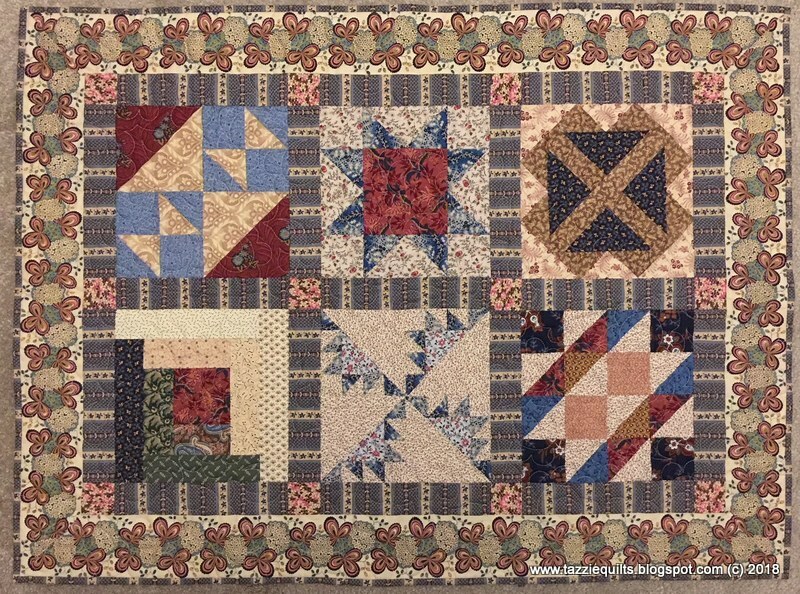 There are some fun fussy cut squares throughout the quilt top, and where I could I've tried to keep any stripes running in the same direction. 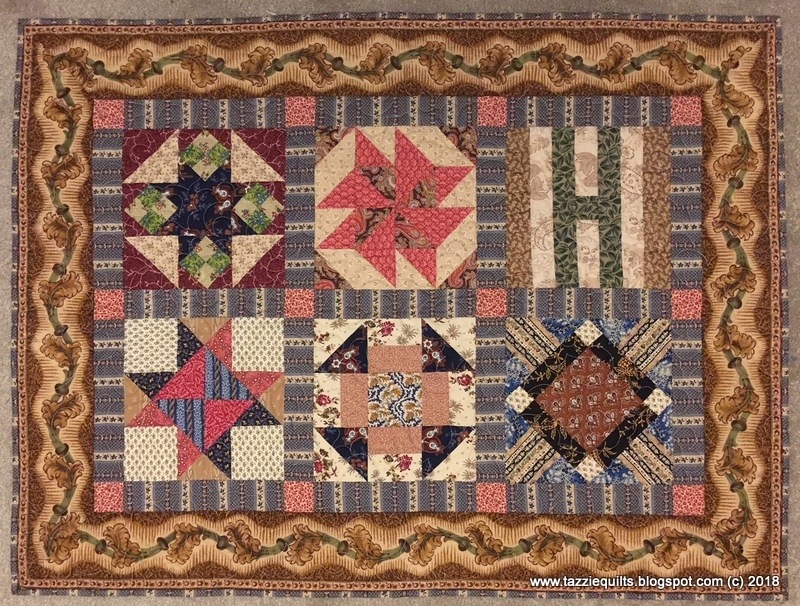 One of my favourite things about working with scraps is remembering the other quilts they've been in and also remembering how the fabrics came to me. 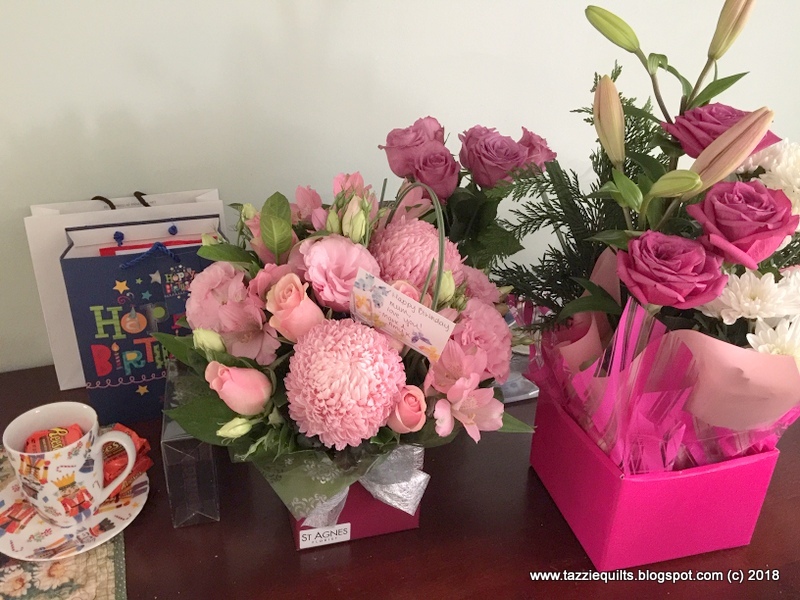 Some from lovely friends and from shops on my travels - or from lovely local shops - all fun memories. Hopefully in the next few days I'll get the rest of the stars in place, and then I can start thinking about the next stages of the quilt. Happy days! From my last post I had some messages I wasn't able to reply to - so a big hello to Holly Field, Co Coya, Alejesnat and Guusje. Thank you so much for stopping by and leaving comments, they're always appreciated. As predicted in my last post, I thought things would move much faster with the Phebe project once the applique was done. So far, that's exactly what's happening. Less than 48 hours after the last applique stitch went in, I had drawn up the foundation papers and stitched the sawtooth borders. Then trimmed them all to size and removed the papers, and finally stitched them in place. Loving it!! Doesn't it all frame the applique so nicely? It has been great to spend some quality time with my sewing machine after so much hand work. And I'm excited to get busy with the next frame of stars - hopefully I'll get one side done tomorrow. In other news, this week I had a little retail therapy after not having purchased fabric in a while. 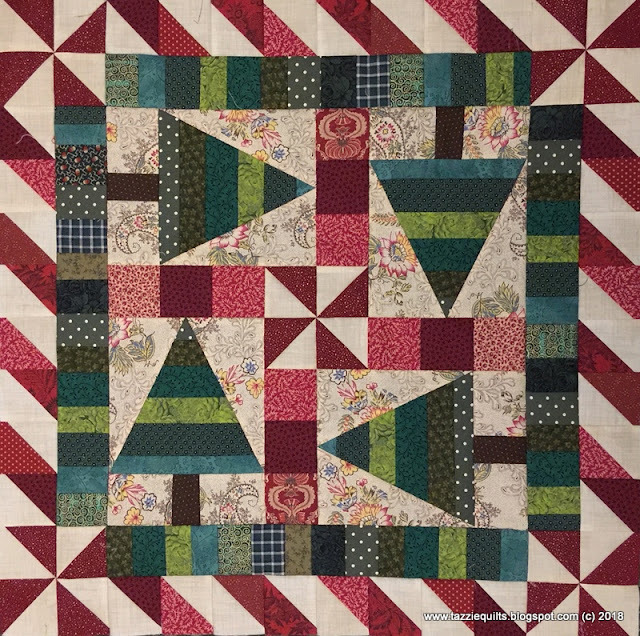 The thing is that I just haven't needed anything as I'm largely working with scraps in this project - and let's face it, even if you don't count scraps, I still have a lot to work with already! Anyway, I found a backing fabric that I felt would work for Phebe, so needed to grab it. I'm a lazy girl and don't much like joining fabrics for backs in projects I know I'll hand quilt ... I liked this one, so it had to be mine. Last of all for this post, I just wanted to share the cake/cupcakes that I made for Amy's engagement party. I didn't know for sure that I'd be able to make the 'naked cake' that she wanted for the top tier, but it wasn't as difficult as I thought it might be. Pinterest to the rescue with helpful links to tutorials. What did we ever do before the internets?? There were 100 cupcakes, half decorated with a swirl, and half with flowers. Bless those wonderful flower piping tips! 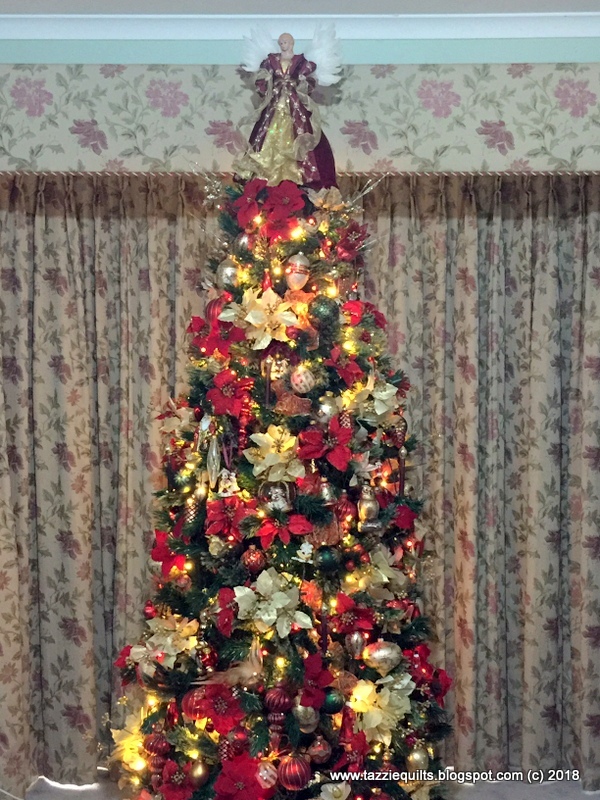 Her theme was gold/pink/black and I managed to get all the colours in. 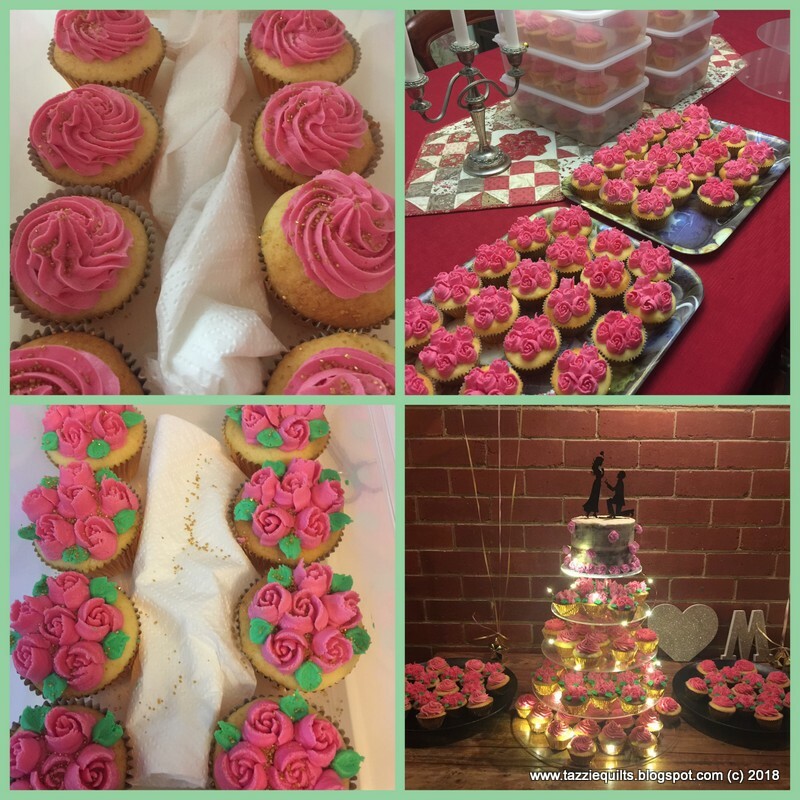 The two pictures on the left in the collage are the finished cupcakes - top right are most of the flower cakes prior to piping the leaves on, and bottom right is how it looked at the venue. I'm so happy I managed to get it all done, and I have a year to think about how the wedding cake will work!